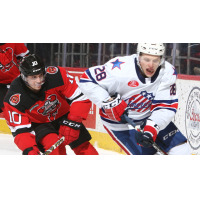 BINGHAMTON - The Devils were unable to come back from a two-goal third period deficit, falling 5-3 to the visiting Rochester Americans inside the Floyd L. Maines Veterans Memorial Arena on Saturday night. Despite carrying the play throughout the first period against Rochester, the Amerks showed the Devils just how dangerous they can be - scoring two goals in the final minute of the opening period. With 54 seconds remaining, Alexander Nylander threaded a cross-ice pass to Taylor Leier at the circle. Leier collected the pass and whipped a wrist shot over the shoulder of Cam Johnson. The Amerks added their second goal of the period with only two seconds left. After a Brett Seney penalty, Nylander took a faceoff win and beat Johnson for his 12th of the year with the lone assist to Rasmus Asplund. Binghamton cut into the 2-0 deficit 4:50 into the second period on the power play. Nikita Popugaev scored his first AHL goal, one night after recording his first point. Seney hit Popugaev with a pass through the slot, and the Russian winger put a puck under the cross bar - blowing up Rochester goalie Adam Wilcox's water bottle in the process. Ryan Murphy earned an assist as well. The Devils tied the game at two with 4:20 remaining in the second period, courtesy of Marian Studenic. Brandon Baddock won a battle along the wall, fed a pass to Studenic in the high slot, who wired a one timer to the back of the net. The tie was short lived. Victor Olofsson beat a screened Johnson on the rush 15 seconds after the Devils had evened the game. Rochester then extended their lead to 4-2, scoring yet another goal in the final minute of the period. Olofsson recorded his second goal of the night, beating Johnson from the slot. Once again, Binghamton cut another two-goal lead in half, scoring at 13:16 in the third. Sam Kurker blasted home a one-time shot on a pass from Desmond Bergin, making it a one goal game. Ryan Murphy earned his second assist of the night on Kurker's goal. However, the Devils wouldn't be able to come back from the two-goal deficit this time. Taylor Leier iced the game with the empty-net goal with 36 seconds remaining - his second of the night. The Devils will face the Amerks again tomorrow, this time on the road in Rochester at 3:05 p.m.
For more information, including pricing, group outings, taking a limo to the game, fan experiences, and much more, visit www.binghamtondevils.com or call the Devils front office at 607-722-7367.